Unlike other commercial fermented yoghurt products that contain two to six microbial strains, Bravo Probiotic Yoghurt contains 42 bacterial and yeast strains including important infant and commensal strains. The preparation process allows the natural production of several powerful bio-active molecules such as lactoferrins, immunoglobulins, noble proteins, anti-oxidants, vitamins and powerful immuno-stimulant factors (GcMAF) and may help to restore a healthy gut microbiome. Four plastic bottles named Powder Mix. Each bottle contains: 5.7 gr of whole organic cow colostrum (first milk) and 0.5 g of a blend of microbial cultures (Lactobacillus Salivarius, Lactobacillus Acidophylus, Lactobacillus Paracasei, Lactobacillus Rhamnosus, Lactococcus Lactis, Bifidobacteri). Total cell number: 80 billion. Each bag contains: Active cultures (Lactobacillus Acidophylus, Lactobacillus Bulgaricus, Streptococcus Thermophylus, Lactococcus Lactis, Leuconostoc, Kluyveromyces, Saccharomyces, Acetobacter, Bifidobacteri). BRAVO Easy Kit DOES NOT contain: Artificial colours, flavours, preservatives, sugar, gluten, soy, wheat, egg, rice, starch, hormones, antibiotics. BRAVO Easy Kit DOES NOT include: Milk, common kitchen tools and utensils. BRAVO combines the known health benefits of different products derived from milk fermentation. It is a harmonious natural symbiosis of active cultures and yeasts known to mankind for thousands of years. All the strains of BRAVO are fully authorized and certified as appropriate and safe for human use by the European Food Safety Authority. Most of the species are from human origin and they have been tested as not pathogen for humans. BRAVO Easy Kit is designed not to be produced industrially and it cannot be found in supermarkets. 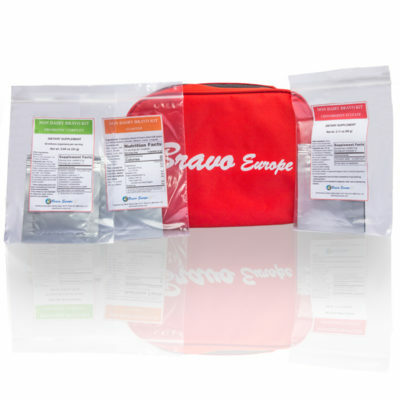 BRAVO Easy Kit, combining the well known properties of fermented products, contains natural (not artificially added) noble proteins, minerals, vitamins and powerful bio-active molecules such as lactoferrins, immunoglobulins, antioxidants vitamins and Vitamin D-binding protein-derived Macrophage Activating Factor. (Probiotics Antimicrob Proteins. 2014 Dec;6(3-4):123-35. Cell Mol Biol (Noisy-le-grand). 2013 Nov 3;59(1):12-24. J Food Prot. 2012 Oct;75(10):1796-805). 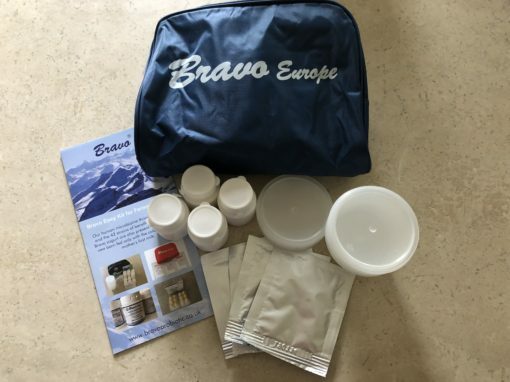 BRAVO is available as Easy Kit containing the powders necessary to make in your own kitchen the final liquid product to drink. The Easy Kit is very easy to be used; it simply requires you buy some MILK. Naturally produce powerful immune-active molecules. Restore the healthy human microbiome. Unlike commercial fermented milk products that claim to stimulate the immune system and contain 2 to 6 microbial strains, BRAVO contains more than 40 microbial strains. The unique formulation of BRAVO derives from the most recent research that demonstrate how much special fermented milk products and colostrum can be beneficial in maintaining health and how they can be included in a complementary natural nutritional approach. The final product, that you can prepare in your kitchen, contains natural (not artificially added) noble proteins, minerals and vitamins spontaneously produced by the living microorganism population (active cultures) in the product. In fact, the original blend and the innovative procedure of preparation potentially allows the natural production of several powerful bio-active molecules such as lactoferrins, immunoglobulins, anti-oxidants, vitamins and immunostimulant factors. A number of proteins contained in BRAVO seems to act directly in the intestine, such as lactoferrin and immunoglobulins (Int J Biochem Cell Biol. 2013 Aug;45(8):1730-47). Many other, however, are encrypted in intact molecules and are released from their encrypted position by the enzymes produced by those microbial strains that constitute BRAVO. Numerous effects have been described after in vitro and animal trials for such bioactive proteins and peptides, such as immunomodulating, antihypertensive, osteoprotective, antilipemic, opiate, antioxidative and antimicrobial. (Eur J Nutr. 2008 Jun;47(4):171-82). Powders are very stable thus, they can be shipped without any refrigeration. However, to extend the shelf life of the powders and to preserve their integrity and efficacy we suggest to store the BRAVO Easy Kit into the refrigerator (about 5°C), far from humidity, in its original envelope. Keep all preparation utensils and materials separate from other household items (for example you could keep them in a clean plastic tub) and use them only for preparing BRAVO. Do not eat or cooking while preparing BRAVO. Utensils necessary for the preparation ofBRAVO can be washed in a regular dishwasher. Besides the powders provided with the kit, to prepare one batch of BRAVO, you need 1 liter of cow’s MILK. It is preferable to use whole, high quality, pasteurized milk (for its high content in proteins). Homogenized or non-homogenized milk can be used. Raw milk can be used since it has to be boiled anyway. Avoid using, if possible, Ultra Pasteurized (UHT) milk since the high temperature used to sterilize it completely breaks most of the milk proteins. Avoid milk with added preservatives, hormones or other chemical substances. In some countries (USA) milk is regularly added with vitamin A (6% daily values), vitamin D (25% daily values) and calcium (30% daily values) and it can be used with no problems to prepareBRAVO. Do not use extra added vitamins A and D milk. Do not use rice, soy, almond, or lactose-free milk. Goat’s milk can be used if the same guidelines are followed. In line of principle, any mammal’s milk may be used. Please remember that changing the source and the kind of the milk the thickness and the taste of the final product can vary. Before starting, be sure to wash your hands. During the preparation use clean paper towels and NOT textile towels for drying and discard them after use. Be sure all work surfaces and utensils are clean. Boil 1 liter of milk, stirring well continuously to keep from sticking to bottom of pot until it boils. Milk boils when it blows up to the rim of the pot. Remove the pot from heat immediately. Do not over boiling the milk. This point is critical. Please see the related video. Cool the milk to room temperature (68-86°F) without stirring it (simply leave it at room temperature). Remove the thick layer off top and discard it (it is mainly composed by caseins). When the milk is warm transfer it into the glass bowl. – Gently add 1 bottle of Powder Mix and 1 bag of Starter and stir thoroughly with a tablespoon until all the clumps have been completely dissolved. Make sure that no clumps are remaining (a simple way to dissolve clumps is to add the powders to a small amount of milk, mix very well, and only when all the clumps have been dissolved, add the rest of the milk). Loosely cover the bowl with aluminum foil so that air can pass over the fermenting milk while it is covered. Set the bowl aside in a draft-free spot where it will not be disturbed and temperature will remain constant. Do not mix or move it. BRAVO will ferment in 24-48 hours depending on the room temperature. You can check, 24 hours later from the beginning, if the thickness ofBRAVO is correct; if you are not sure about its thickness, you can remove a little part of the surface (near the rim) by a tablespoon. If BRAVO is not thick as expected, wait up to 24 additional hours until it is thick enough (it can stay at room temperature for maximum 48 hours). You can check from time to time but without stirring it; the process of stirring will stop the fermentation process. Once BRAVO has reached the appropriate thickness, mix it well using a tablespoon. If clumps are present, strain it using the metal strainer. Please see the related video. Store BRAVO into the refrigerator. BRAVO, once it has been prepared and it is ready to drink, has an expiration of about 2 weeks if properly stored into the refrigerator. BRAVO may not be frozen. Use a maximum of one 4-oz (125 ml) serving daily at the end of a meal rich in vegetables or leafy greens (fibre). Shake well before consuming. Flavour, if desired, with high-grade honey or fruit. While drinking BRAVO, do not consume sugar substitutes or artificial sweeteners (such as in beverages, foods, and chewing gum) because these substances deteriorate the product’s properties. Do not wash the teeth for at least 1 hour after consuming it. Keep it inside the mouth for about ten seconds before swallowing it. Do not consume past the fourteen-day expiration date. BRAVO is not intended to diagnose, treat, cure or prevent any disease. Awesome! With the 4 x week pack. I made up 2 batches at a time. Noticed changes after the first week. I bought this for my son, but ended up sharing it with him. I didn’t expect to notice any physical changes with it, but I felt a difference within the first week of taking it. I’m now ordering more to give it to the rest of my family as its definitely worth the investment. I would heartily recommend this product to anyone who needs an immune boost.